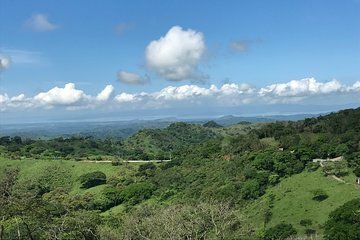 Venture into the Monteverde Cloud Forest even if you're based in San Jose with this all-inclusive day trip. An experienced driver handles the steep and challenging roads to get you safely to the mountainous reserve, where you can explore the mist-shrouded rain forest via hanging bridges and an aerial tram. After the canopy adventure, get an up-close look at snakes, frogs, and butterflies at a reptile garden, and recharge with a typical Costa Rican lunch. Luxury round trip transportation with A / C and Wi-Fi. I traveled with Daniel and it was a good tour. It's a long day from San Jose, and you'll be thankful that you didn't rent a car and drive. The roads are really challenging and are going to be upgraded, and there are limited signs. You drive for a few hours, stop for breakfast, and then get to Monteverde in the midmorning. The hanging bridges are great and the guides very knowledgeable about where different birds and animals live. No guarantees that you'll see anything, and it was raining for a lot of the time. But it's well maintained and I recommend taking the longer bridge option. There is also an aerial tram, but by the time that left the main building, it was pouring rain and windy. If you're nervous about heights or swinging, you may not want to do this. Nothing to see because of the weather except a poor soaking wet coati looking for shelter. I would go back to see more on another day, but it's a cloud forest, so no weather guarantees, even in the dry season. There is a herpetarium on the way out of town with a brief tour and a local restaurant for lunch. You get back to San Jose around 7. Ticos have a different sense of time than we have in the US, and are uniformly kind and helpful.